Home / apple music / feature / G.E / jam hsiao / karen mok / Li Ronghao / M. / music / nicholas tse / Stars unveil their Chinese New Year playlists! 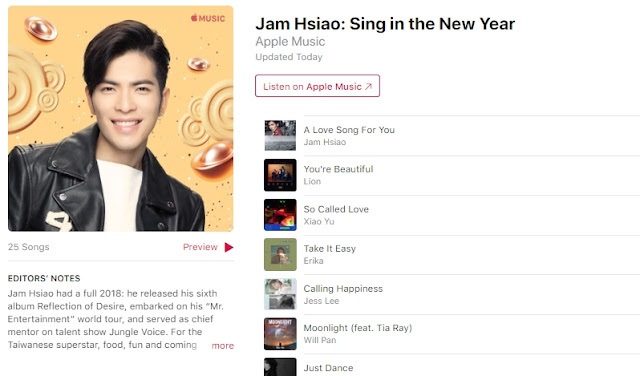 Stars unveil their Chinese New Year playlists! 2018 flew by like a breeze, and while there were many ups and downs, the one thing that's always constant is great music. In collaboration with Apple Music, popular Chinese pop stars have unveiled their favourite music of the past year, just in time for the Lunar New Year celebrations next week! Check out these carefully curated playlists that reflect each artist's personal taste, and feel free to get those speakers blaring at your gatherings to share with friends and family this auspicious season! 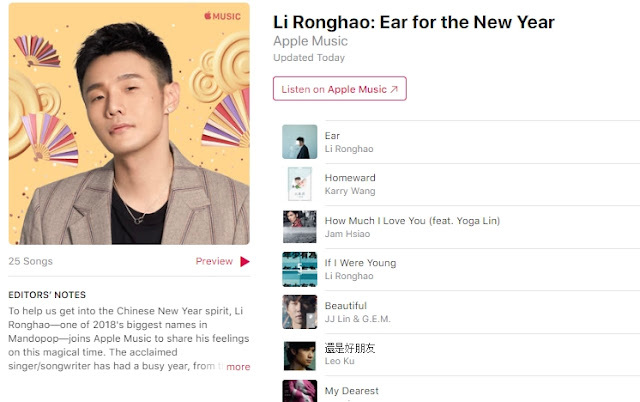 Mandopop's shining star, Li Ronghao might've just released his latest album, "Ear" and worked on the music reality show "Idol Producer", but he isn't too busy to share his carefully selected playlist. Besides "Ear" and "If I Were Young" - the lead singles from my new album "Ear"- I also include "Soar" by a singer l really enjoy, Eason Chan, as well as a song I wrote for Karen Mok called "Growing Fond of You". I also chose Jackson Wang’s "Different Game", hoping to bring something different to your ears this Lunar New Year. 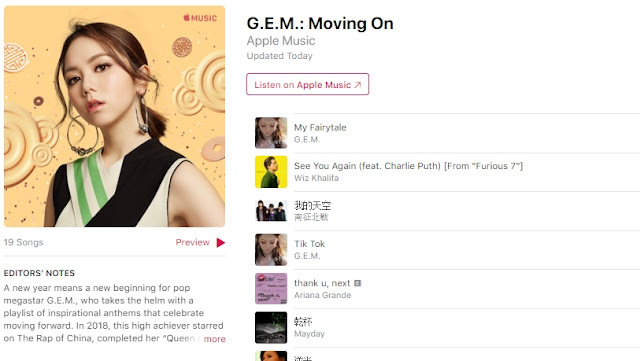 After having been all over the news in 2018 for winning countless awards and even making it as one of Stan Lee's comic book character inspirations, G.E.M. is no stranger to the world. 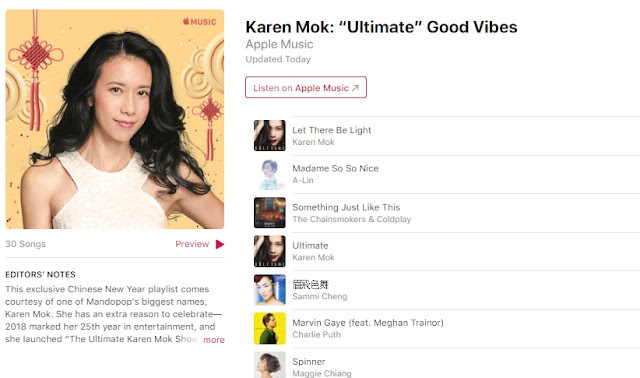 Her playlist features artists like Jay Chou, Sun Yanzi, Taylor Swift, Ariana Grande and more! A new year brings a new atmosphere. I wish you all the best, and hope we all continue ahead to reach the destinations of our dreams! Marking her 25th year in entertainment, Karen Mok shares some hits of her own as well as tracks from Queen, Justin Timberlake, Eman Lam and more for a feel-good playlist. Happy Chinese New Year everyone! I wish you the best of health. I hope I can give even more good songs to Chinese all over the world. 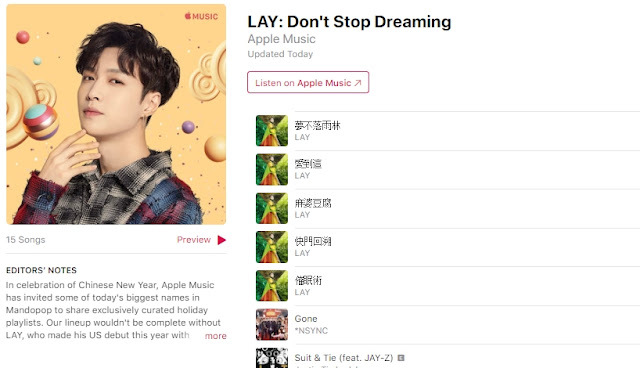 LAY has been shaking things up not only locally but internationally as well with his US debut this year with "NAMANANA". Tracks from his bilingual album are definitely included in his playlist as well as those from the King of Pop, Michael Jackson - his ultimate inspiration. I hope everyone likes this Chinese New Year list and has a happy Spring Festival holiday. I wish you all a Happy New Year. May all your dreams come true! This list starts off with "A Love Song For You, the lead single from my latest album. Then there is my collab with Yoga Lin, "How Much I Love You", followed by the catchy “Finesse (Remix)” by Bruno Mars featuring Cardi B. I hope you sing along to this collection of feel-good music during your New Year celebrations! 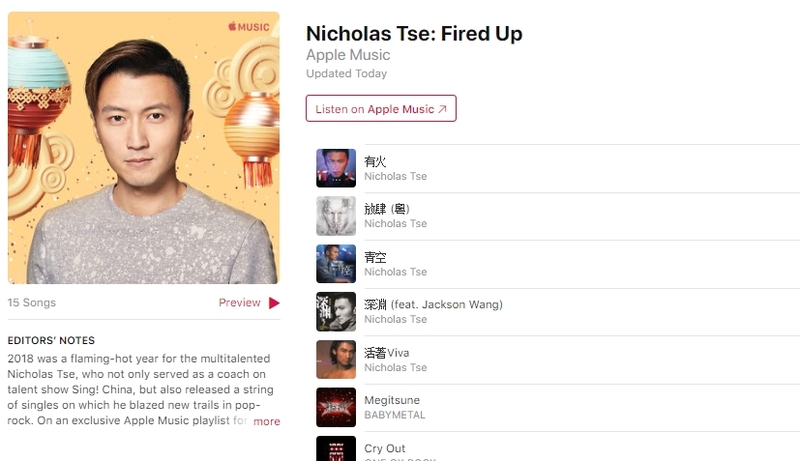 Back in the music world last year, the multi-hyphenate Nicholas Tse released a string of singles last year including a very recent Linkin Park inspired hit "Abyss" which he wrote as a tribute for Chester Bennington. Rock ’n’ roll is one of my musical essentials. From Western legacy bands and Hong Kong classic groups to the latest Japanese upstarts, they all inspire me—so they’re all included in this list. Of course, there’s a lot of my own music from different periods, too. I hope you pick up on all the different musical elements in them. I wish you all a warm Chinese New Year! chewy dog crates is underneawhereas the bound is over. this implies there's scope for BarkBox “complicate” their rating. client merchandise try to keep ratingstraightforward to scale the friction within the sign-up. The way you bring passion and engagement into the things you do can really change your outlook on bouncing balls , red ball live.